Today I thought I’d share one of the cards I made, using the Hearts Come Home stamp set. I had fun creating this little window scene, and getting inky doing the sponging! Stamp Set: Hearts Come Home. Inks: Tranquil Tide, Tempting Turquoise, Perfect Plum, Night of Navy, Basic Black, Smoky Slate. Papers: Wood Textures Designer Series Paper Stack, Tranquil Tide cardstock, Basic Black cardstock, Whisper White cardstock, Window Sheets. Accessories: Big Shot, Hometown Greetings Edgelits, Hearth & Home Thinlits, Pattern Party Decorative Masks, Sponge Brayer, Sponge Daubers, Wink of Stella Glitter Brush,Tags & Labels Framelits (retired), 1″ Circle Punch. I started with the focal point – the window scene. First I die cut the window using the Big Shot and Hearth & Home Thinlits, from the Wood Textures DSP. This way, I knew what size I needed my scene to be, to fit inside the window. Next, I die cut the small row of houses from Basic Black cardstock, with the Hometown Greetings Edgelits. This set is great, as it has 2 sizes of the rows of houses – so you can fit them proportionally to your project. Finally, I cut a piece of Window Sheet to the same size as the window. I cut a piece of white cardstock to create the background. I punched a 1″ circle from the sticky part of a Post-It note, to mask off an area for the moon. Then I used Sponge Daubers and added Tempting Turquoise, Perfect Plum and Night of Navy ink to create the night sky. Removing the mask, I then stamped the Santa’s sleigh from the Hearts Come Home stamp set in Basic Black. After that, I flicked some Wink of Stella onto the sky, to create a nice glimmer for the stars. It’s too bad that it doesn’t show very well in the picture! Since the scene is supposed to be looking from inside to outside, I decided I’d create my own ‘wallpaper’ on the Whisper White panel. I placed the Pattern Party mask over the cardstock, then used the Sponge Brayer to apply the Tranquil Tide ink. I didn’t want a whole solid wall – I thought it would look to heavy – so I just did a portion, and let the colour fade in some areas. Finally, the sentiment from Hearts Come Home is stamped onto white in Tranquil Tide ink. The retired Tags & Labels Framelits are used to die cut it, and the Tranquil Tide layer behind it. Now comes the easy part! Now that you’ve die cut, sponged, brayered and stamped, putting the card together is a snap. First, attach the window sheet to the back of the window with Tear & Tape. 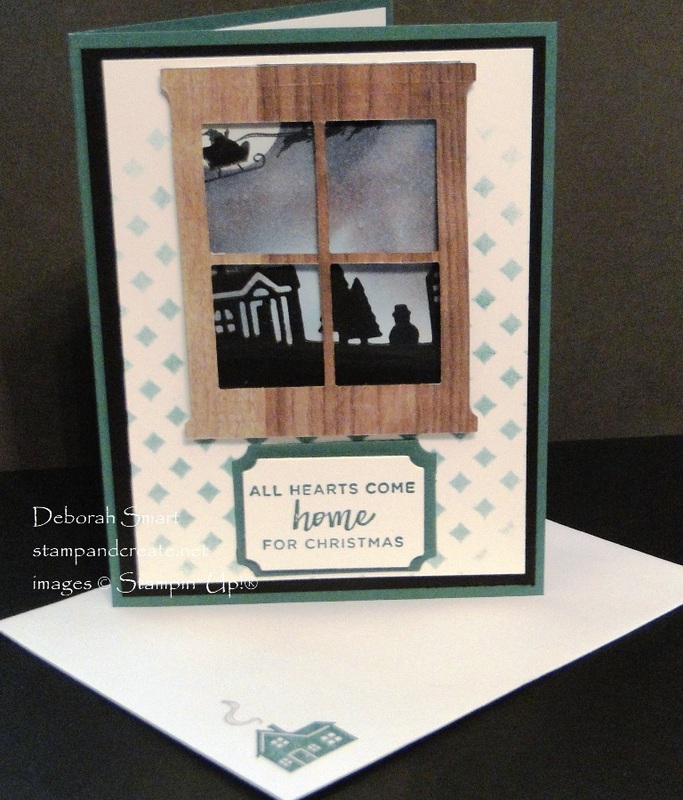 Attach the die cut houses to the sponged background with Liquid Glue, then attach that panel to the back of the window with Stampin’ Dimensionals. Next you want to attach the window to your brayered panel with Dimensionals. Then attach the sentiment with Dimensionals to the Tranquil Tide layer, and attach it to the brayered panel under the window, with Liquid Glue. Now you can put your panel onto the Basic Black cardstock panel with Dimensionals, then affix the whole front to the Tranquil Tide card base with Liquid Glue. REMEMBER THE INSIDE and THE ENVELOPE! 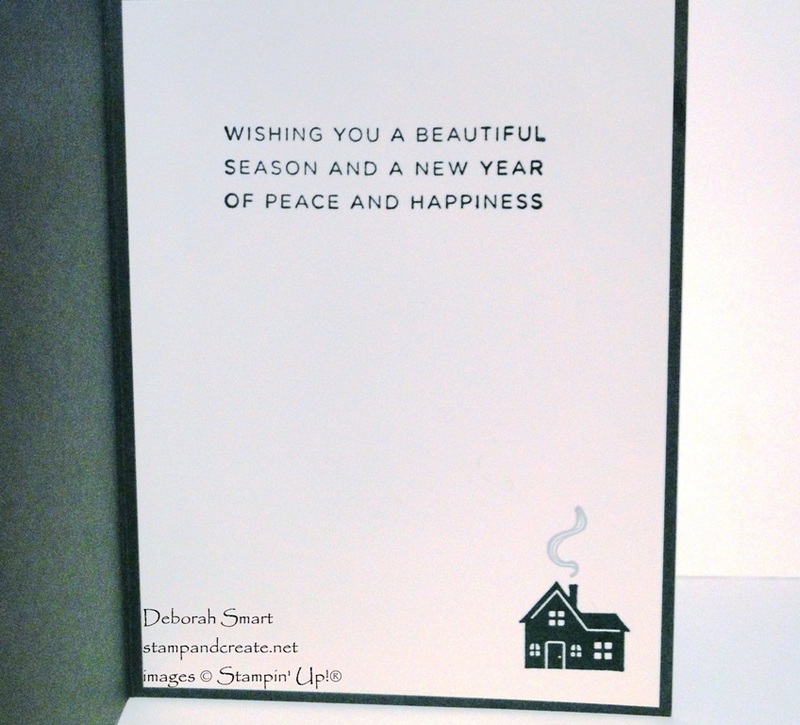 The sentiment is stamped onto a panel of Whisper White cardstock in Tranquil Tide ink. I then added one of the house images onto the bottom right corner, and added some chimney smoke in Smoky Slate ink. Isn’t that cute?! And if you look at the 1st picture, you’ll see that I added the same house on the envelope, as well. ORDER SUPPLIES & CREATE YOUR OWN! I hope I’ve inspired you to get creative, and create you own version of my card! I’d love to hear what you think of it, if you’d like to leave a comment 🙂 You can order the supplies I used by clicking on either the images below, or my signature. My online store is always open, for your convenience! Previous Previous post: Merry Cafe Free Tutorial! Next Next post: Taking a Day Off!